In part 1 of this series I showed how you can use the keyboard and mouse together to select ranges and bring up the research pane. 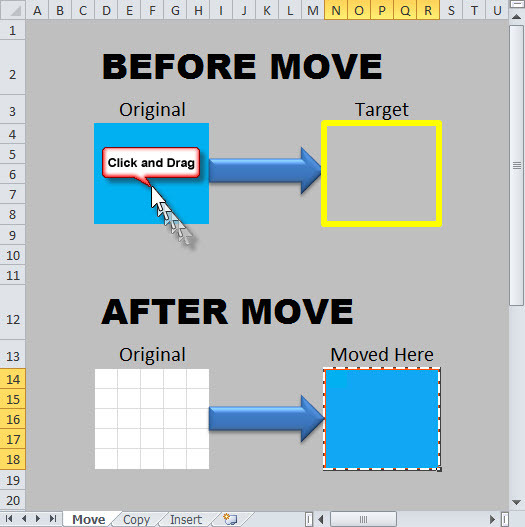 In this second article I am going to explain ways to use the keyboard and mouse together to move, copy and shift cells around a workbook by dragging the selection border that surrounds the cells you have selected. Why would you want to do this? You might have entered data in the wrong place, or put a formula too close to a chart, or any other number of reasons. 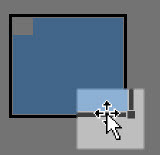 You can move your selection (1) dragging the selection border with the mouse, or (2) using the cut and paste keyboard shortcuts. 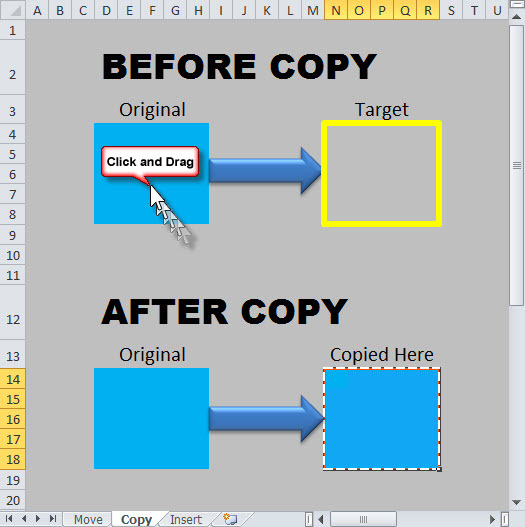 In both cases, the target cells are replaced with your original selection, overwriting what was there. When would you want to copy cells from one place to another? There might be some cells that you have carefully laid out and formatted, and you want to re-use these as a template in another place on the worksheet. Or you might have a column of formulas that need to be duplicated in another column. 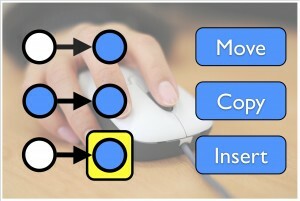 You can achieve this (1) using the copy and paste keyboard shortcuts, or (2) holding CTRL while dragging the selection border with the mouse. In both cases, the target cells are replaced with original cells, overwriting what was there and the original cells are kept in place. When you move or copy formulas, the cells references inside them will either stay the same if you use dollar signs (absolute references) or change relative to their position on the worksheet if you don’t use dollar signs (relative references). Relative references are written like this “A1” or “B1:B10” and when you move or copy a selection that contains relative references, Excel recalculates the reference in relation to the new position. Absolute references are written like this “$A$1” or “$B$1:$B$10” and when you move or copy a selection that contains absolute references, Excel keeps the reference the same, so it is always “$A$1” or “$B$1:$B$10” regardless of where in the worksheet you have coped the selection. You can also mix and match the dollar signs to keep either rows fixed or columns fixed or both fixed. So “$A1” fixes the reference to column A but doesn’t fix the row. And “A$1” fixes the reference to row 1 but doesn’t fix the column. Here you want to shift your selection around the worksheet, and have Excel reorder your worksheet to accommodate the selection without overwriting the existing cells and without creating a new copy of your selection. This is really handy if you have a list of items and want to reorder that list quickly. You can either insert your selection between columns or between rows. It takes some practise to get used to using the selection border especially when you are first learning. Once you get the hang of it, you will really appreciate this quick little productivity tip especially if you need to reorder lists manually. What’s coming up in Part 3 of this series? 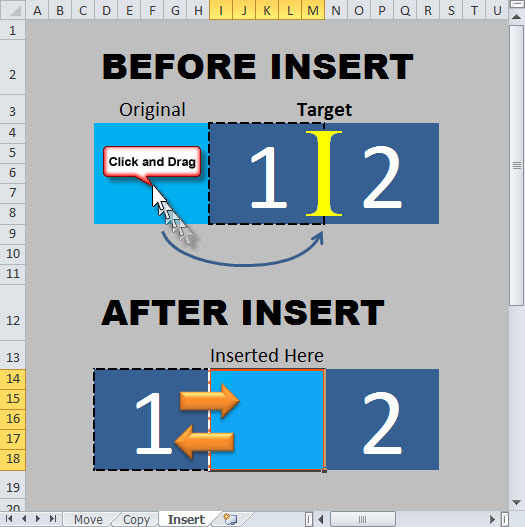 In part 3 I’ll show you a trick with mouse right click → accelerator key combos that you can use to boost your speed in Excel. I find these accelerator key combos easier than memorizing keyboard shortcuts and you can use them in all Windows application that supports accelerator keys. What are accelerator keys I hear you ask? Well all is revealed in the final part of this series. Learn how to use Excel more effectively and stay up to date with the latest articles and videos from Launch Excel (it's free). Plus... get a bonus PDF with more than 100 popular Excel shortcuts, FREE when you sign up today. Keyboard or Mouse… Which is more effective? You'll learn how to use Excel more effectively and stay up to date with the latest articles from Launch Excel (it's free). Plus, you get a bonus PDF with more than 100 popular Excel shortcuts, FREE when you sign up today. Before you go... don't miss out on the latest email updates - sign up now! Plus, get a bonus PDF with more than 100 popular Excel shortcuts, FREE when you sign up today.